Norwood Warrior ($0.18) Price History from major stores - Portal Second Age - MTGPrice.com Values for Ebay, Amazon and hobby stores! Card Text: Whenever Norwood Warrior becomes blocked, it gets +1/+1 until end of turn. 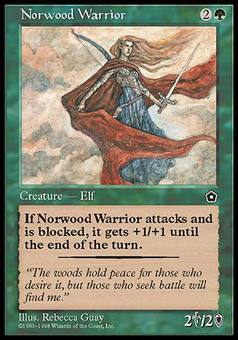 Flavor Text: "The woods hold peace for those who desire it, but those who seek battle will find me."